Want to get organized but don't know how? 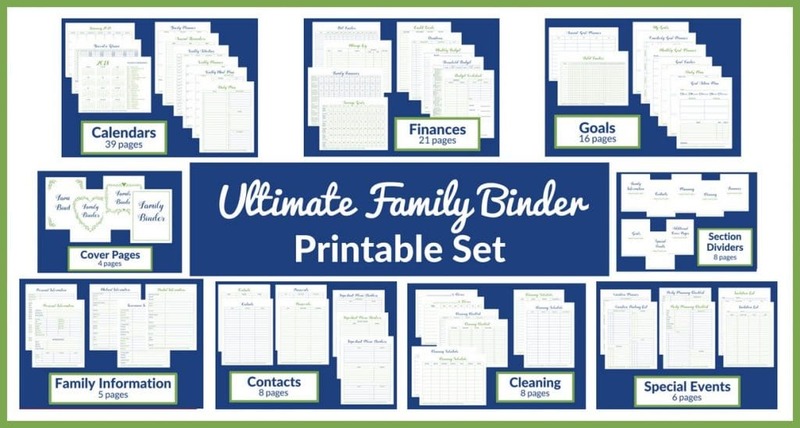 The Ultimate Family Binder has everything you need! Hi, I'm Corinne. I'm a busy mom too and this binder is a large part of how I'm able to work, raise five kids, and keep my sanity. Tired of Wasting Time and Energy? Mom life is super rewarding. It's also full of challenges! When you have small humans to take care of, making time to do things like shower, remember names, and pay bills by their due dates becomes a major challenge. ​Mom mistakes? I've made them all! I didn't like feeling like a failure. So, I spent a lot of time developing systems to help me avoid the mistakes I kept making. For me, checklists were really helpful. And keeping everything in one place so that I didn't waste time looking for information in a dozen different places. I finally discovered A SIMPLE SOLUTION to all my problems. I created a family binder and organized it into sections so I could easily find what I needed within it. I recreated all of my lists and worksheets so they had a similar look and general layout. I included multiple layouts and planning sheets so that no matter how you work, you'll find a system that works for you within the set. I created the set in multiple colors so you could find one that fits your taste and personality the best. No more looking through the junk drawer for the plumber's business card or rummaging through your desk for the sticky note with the babysitter's number on it that your neighbor recommended. 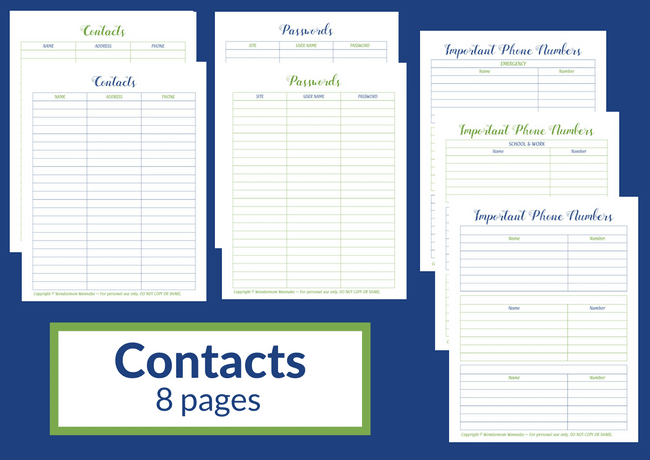 The Ultimate Family Binder Set has places to jot down all of your important contacts from doctors to pizza delivery. Plus, there's a page to write down your passwords too. You're busy enough already and then you add your family's activities and appointments on top of that and it can be hard to keep track of it all. The Ultimate Family Binder set is FULL of calendars and planning sheets to help you manage the busiest of schedules. 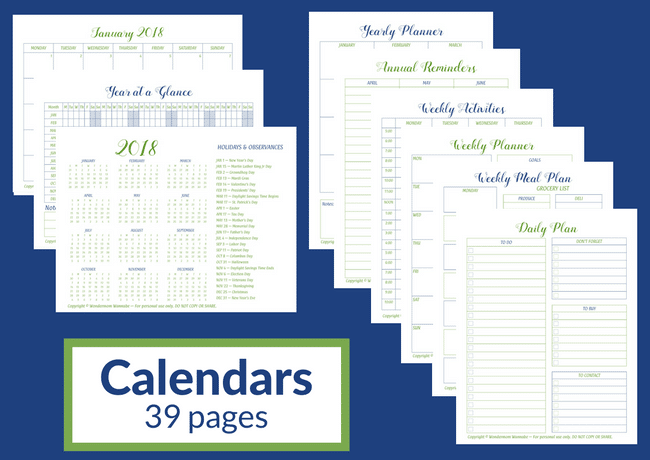 Even better, your purchase includes FREE updated calendars for life! You can't get where you want to get in life without creating a plan and working to achieve it. 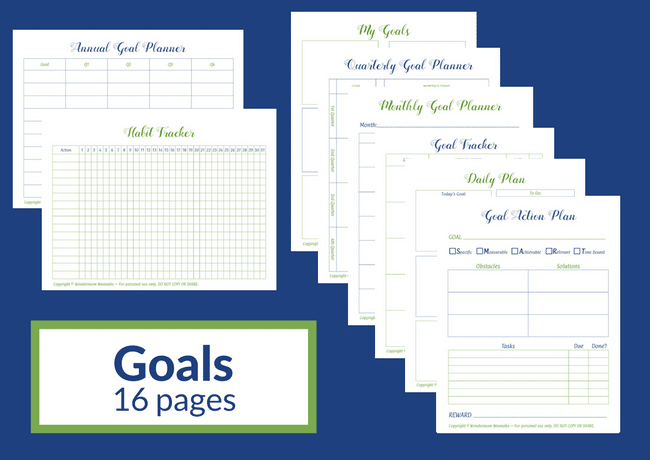 The Ultimate Family Binder set comes with a variety of goal planning sheets to help you visualize your goals. More importantly, it help you achieve them by walking you through the tasks you need to complete and the actions you need to take. Managing your money isn't difficult as long as you track what you're earning and spending. 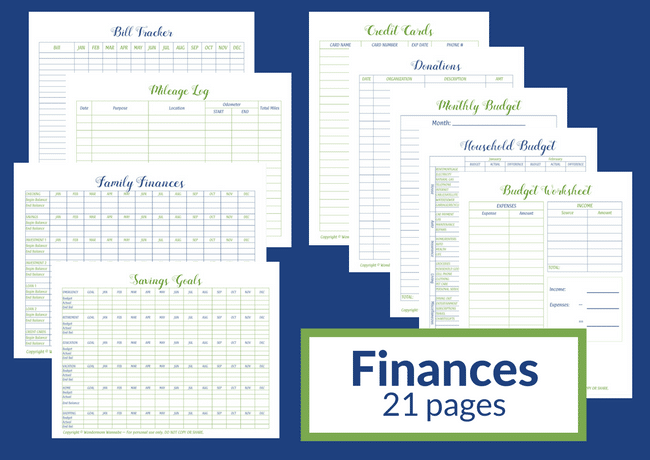 The Ultimate Family Binder set includes several sheets to help you plan, track, and manage your budget and finances. It even includes sheets to record your charitable donations and mileage! Overwhelmed by housework? Once you make a plan and stick to it, keeping your home clean and tidy is easy! 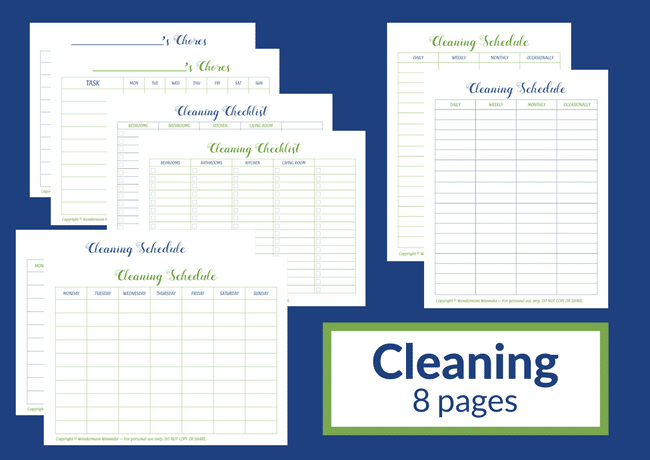 The Ultimate Family Binder Set includes a variety of sheets to help you set up a cleaning schedule and tasks to make it easy to stay on top of your housework. Your life isn't all about work. You need to take time for fun and relaxation too. 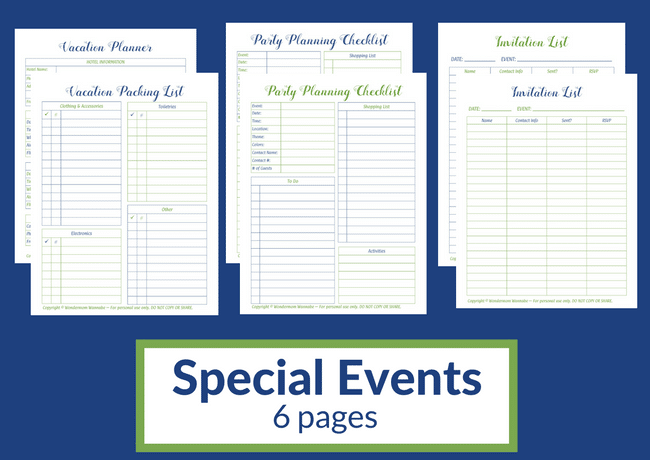 That's why this printable set includes forms to help with party and vacation planning. That way, the most fun and relaxing parts of your life can be chaos and stress-free. The Ultimate Family Binder Set includes a few extras to make your binder complete. You'll get section dividers to separate each category. Plus, different cover options so you can choose the one that you like best (or that fits your mood that day). That's a total of 115 pages (88 in black and white version), all designed to help you have an awesome home life. Ready to be more organized and less frazzled? "I love Corinne’s Family Binder. 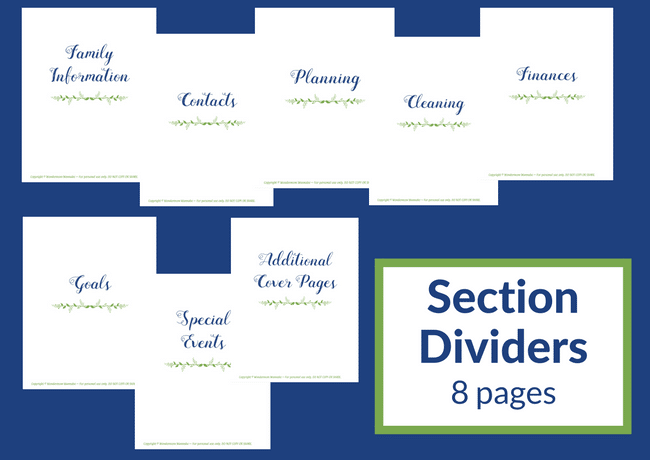 She has pages for everything you need to keep your family organized. I already had a few of these items organized, like budget, important dates, and some medical information, but none of it was in the same place. The binder not only helps you get organized/centralized but helps you realize the different parts of life that you probably want to keep track of. Her set-up is simple which makes it easy to follow through with completing the pages and getting all this important information together." 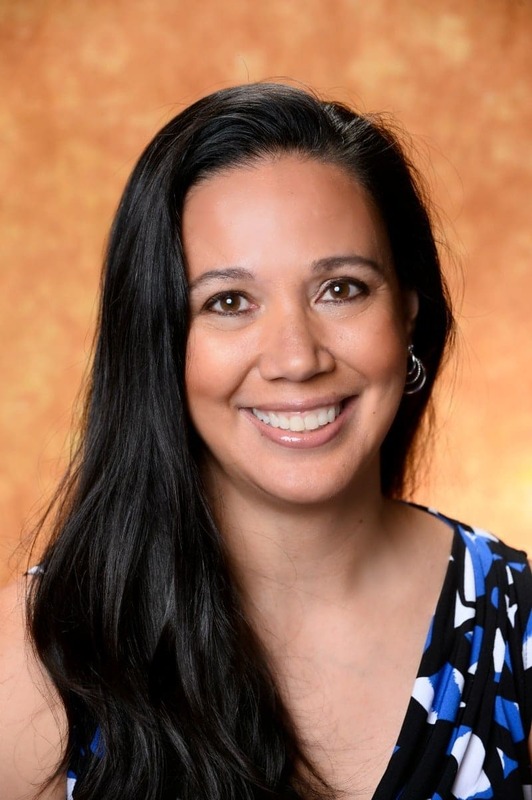 "It’s hard to stay organized as a working mom. Work schedules, school schedules, family commitments, taking care of our home, feeding my family, and everything else that comes my way. How do I organize everything and keep my sanity? My Family Binder. It's the one place I can neatly store everything I need to keep, at an arm's reach. My Family Binder helps me easily balance work, family, and my home." "I love the fact that it has everything I need when I look for a planner all in one place! I believe this planner is worth more! It is well done and very helpful and of course a great quality product. Corinne’s planner is a planner I recommend to my family and friends and readers!" Are you ready to get your life completely organized? You're just seconds away from taking charge of your home life. 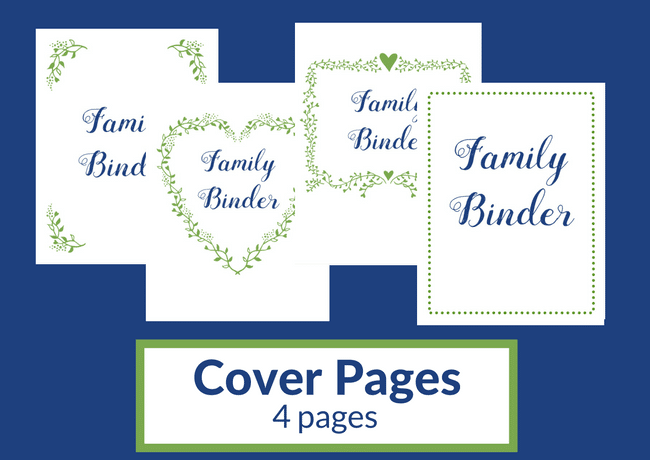 Just click the button below to purchase your Ultimate Family Binder set. You'll be able to download and/or print it immediately. If you've read this far, I'm going to assume you are interested but still have reservations. That's good! 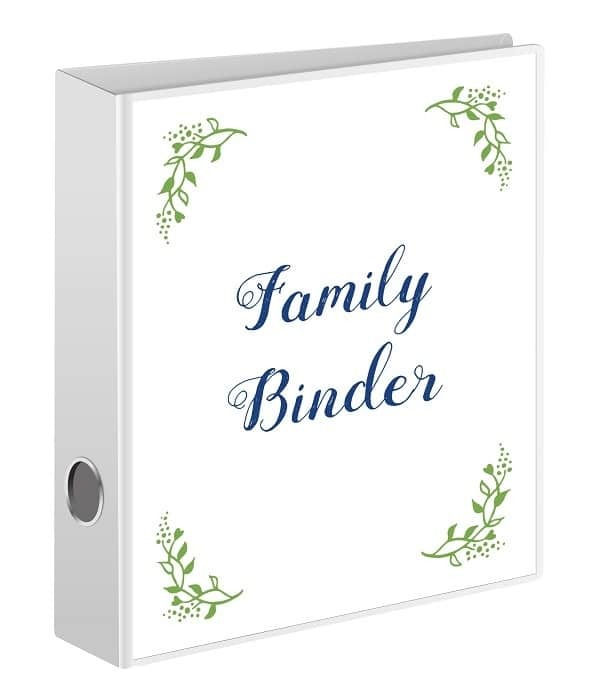 Using the Ultimate Family Binder requires a fair amount of commitment so you SHOULD have to think about whether or not you will actually use it. My passion is to help other moms feel like superheroes. If you purchase this binder, I want you to succeed! I want you to have a happier, more organized home life. Not everyone will achieve that with this binder. Check out the comparison chart below to see if this system will work for you. If you are a free spirit who gets bored easily, you aren't destined to a disorganized life. But your solution isn't the Ultimate Family Binder system. If, however, you ​get excited by shopping trips to Staples, this might just be the answer you've been searching for. Just filling out the Ultimate Family Binder will give you a sense of calm and control. For once, you'll have everything you need in one place! Then, you just need to keep it updated (a few minutes work each day). This DOES work, if you use it!